WTware boot from IDE CDROM - Windows Terminal Ware. WTware terminal is able to boot from CD. To make bootable compact-disk you should prepare its image in a special way. WTware boot CD image generator - utility in WTware configurator, that prepares such images. When "Receive from DHCP-server" item selected, terminal requests DHCP-server for network parameters while boot. Certainly, DHCP-server (only one!) should work in network to send all needed settings to terminal (terminal address, subnet mask, TFTP address). So you can create the same disks for several terminals. 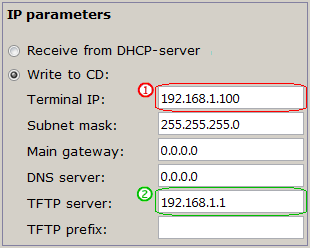 DHCP-server will send them unique IP-addresses with no duplacates. Read manual for DHCP configuration for WTware terminals to find out additional parameters. When "Write to CD" item selected, network settings configuration file is included into CD image. Use this option if there's no DHCP-server available or it shouldn't be used. Specify terminal IP-address in "Terminal IP" field . Don't forget, that any computer (and any terminal, print-server, WiFi access point and any other device) on network must have it's own, unique IP-address. Specify terminal subnet mask in "Subnet mask" field. Required parameter. Specify default gateway, router in "Main gateway" field. Optional parameter. Specify DNS-server address in "DNS server" field. Optional parameter. Specify TFTP-server address in "TFTP server" field . This parameter is required when item "Download configuration file from TFTP" is selected. On this computer terminals configuration files will be stored. Specify part of the path from TFTP-server root to directory, that contains WTware files, in "TFTP prefix" field. Automatically this value is set to default value for WTware directory structure. Specify another value only if you changed TFTP-server paths. 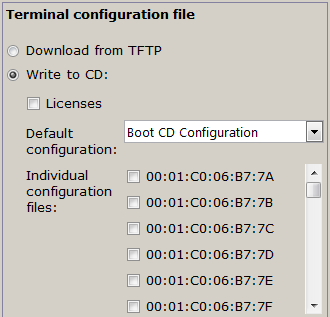 When "Download from TFTP" item selected, terminal downloads configuration file from TFTP server while boot. Server address should be specified manually or received from DHCP. When "Write to CD" item selected, configuration file - default configuration - is included into CD image. Use this option if there's no TFTP server available or it shouldn't be used. Configuration file name is insignificant. It will be renamed so that any terminal regardless of its MAC-address could boot from this CD and use configuration file parameters. If you store configuration file on disk, you can work without TFTP service. It's good for remote offices with no dedicated server. But you'll have to rewrite disk to make any change to configuration file. to set different IPs for different terminals that will boot from this CD. License file may be stored on disk. This file can contain many licenses, so that every terminal, that boots from this CD, could find its license. When using Nero Express select "Disc Image or Saved Project".